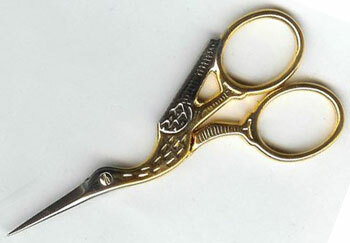 Premax 3.5 inch / 9cm embroidery scissors, gold coloured. Made from precision hardened and tempered steel in Italy. I recommend these scissors as ideal scissors for cutwork embroidery such as Hardanger, Portuguese whitework, drawn thread work, merezhka and Schwalm embroidery. They have fine sharp blades which makes them ideal for slipping between fabric threads and making a neat, careful cut. You can read more about my criteria for the ideal scissors for these sorts of embroidery in a post on my blog, White Threads. These sharp embroidery scissors have have a blade point angle of approximately 10 degrees, measure a smidgen more than 2mm width across both blades 8mm up the length of the blade, and have pointy blade points. The Premax 3.5 inch embroidery scissors are guaranteed for life, by the manufacturer, against any failure arising from defective material or workmanship. Premax 3.5 inch / 9cm embroidery scissors.